Vitamin E Oil Stick: This little wonder stick provides a clear gloss on your lips that moisturizes and protects with an SPF 15 factor. It's never sticky, has little to no scent, and leaves your lips ultra-soft. It can also be used under the eye area for moisture and protection, and I've used it several times to moisturize my cuticles when I don't have a proper cuticle product handy. Reviva Labs informed me that your lips do not have Melanin in them, making them more vulnerable to the sun's harmful rays. Using an SPF product such as this one will protect them from burning and keep them hydrated. This is a product that I'm never without, and I always have a couple of tubes stashed away. It seems to melt right into my lips, and I find that it lasts longer than most lip balm protectants. Tan Without Sun Face & Body Milk: This product gives my skin a nice touch of color within four hours, and I'm also able to use it on my face with no adverse reactions. This is a "milk" so it's a thinner formula making it easier to blend and apply to your skin, which reduces the chances of streaking. The smell is mild and much easier to tolerate than many other brands I've used. I use this for 3-4 days in a row to get my desired depth of color, then continue to use it twice a week to maintain a golden glow. The color lasts about 3 days without continued use, and gradually fades over that time. There is no SPF in this product, so use of a sunscreen is advised. Ingredients: Purified Water, Glyceryl Stearate and PEG 100 Stearate, Dihydroxyacetone (keto sugar), Isopropyl Palmitate, Sorbitol, Coconut Oil, Cetyl Alcohol, Myristyl Myristate, Cetyl Ester, Allantoin, ImadUrea, Methyl & Propyl Paraben, Lactic Acid. Does not contain Coloring Dyes, Stains. Entry details: Prize package will be mailed directly from Reviva Labs, so all entrants must reside in the United States. Contest ends June 3 at 12:01 a.m. To enter, just leave a comment below and let me know how vigilant you are about using SPF products, especially during the Summer months. Do you insist on using products that contain an SPF factor? Also leave your eMail address so I can contact you if you are the winner. If you aren't comfortable sharing your eMail, be sure to check back on June 4 when I announce the winner, then you can contact me at mej0620@hotmail.com. 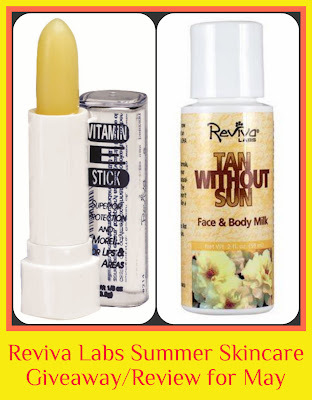 Based in New Jersey, Reviva Labs produces all natural products and never tests on animals. They proudly support the nonprofit Marine Mammal Stranding Center in Brigantine. This is the only agency involved with rescuing, rehabbing and releasing injured or sick seals, giant sea turtles or other mammals (including dolphins and whales) that wash ashore along New Jersey’s 1800 mile coastline. Some coastal states have six such agencies. New Jersey has only the Brigantine Center. I usually have at least 1 lip balm containing spf (eos lemon drop) and 1 moisturizer containing spf (aveeno ultra calming). I use those daily if I know I'll be going outside. but if I know I'll be taking pictures or just lounging inside, i skip the spf! I am a fair skinned gal as well as being a huge fan of the American Cancer Society. Melanoma is the the most common form of cancer so sunscreen is something everyone should be using even in overcast weather (UV Rays are always there). I have used sooo many types of sunscreen and self-tanners; right now my favorites are Jergens Foaming Gradual Self-Tanner and Vaseline's Aloe Moisturizer with SPF 15. I love how many cosmetics now include SPF as well... I was also excited to see Chapstick released a Green Apple lip balm with SPF. Maybe I will end up liking this better! I have to be diligent with SPF products, even lip balm! I fry like its my job in the sun :(. All these goodies would come in handy! I am definitely more diligent on using sunscreen. I wish some of my everyday face products had SPF though. I use a sunscreen in my moisturizer and in my lip products and thats about it. I could do better. I always use sunscreen on my face, and everywhere else if I'm going to be out in the sun long. I use sunscreen if I know I'm going to be outside for long. But I actually don't spend a lot of time outside, so I rarely use it. If I don't have my purse, I have one in my pocket. And I use spf body lotions, multiple times, on a daily basis. If I'm going swimming or going to be outside, I use sun screen. But if I'm laying around the house, just the lotion. I usually just settle for the spf that is in my makeup. During the summer/times when the sun is out more I will try to use a tinted moisturizer with spf as my base for the day. I also make sure to put extra sunscreen on my shoulders in the summer.